A fusion of ancient technology with modern modalities. The Washington Post & WTOP featured our company Human Activation in articles raising the awareness for wellness through meditation. Want to read more about the science? Click here. For thousands of years, masters of alchemy have been forging powerful instruments from their ancient wisdom, called Tibetan Singing Bowls. Modern science now recognizes the advanced application of these instruments because of their powerful binaural beats and rapid transcendental relaxation ability. We bring these ancient tools into our modern workplaces to provide rapid relaxation and recalibration for a refreshing reboot in our modern stressful world. These instruments have been used in many ceremonies and religions through the millennia. Our use of these sacred instruments is no longer tethered to any religion, custom, or dogma, instead used for the unification and alignment in our complex cultural world. Made from 7 - 12 different metals and minerals, the mixed alchemy of these bowls are now used to forge new levels of achievement, unification, and productivity in our modern society. Find yourself in a warm, inviting room of people who are buzzing with excitement. They're stretching, whispering, laughing, sitting, standing, or laying down. All different, yet they're all here for a common purpose--to be immersed in the relaxing frequencies of Tibetan Singing Bowls. They're here to experience a Sound Bath. You stand on your tip-toes and crane your neck to grab a glimpse of the beautiful art installation at the center of the room. Suddenly, a hush of silence washes over the room. 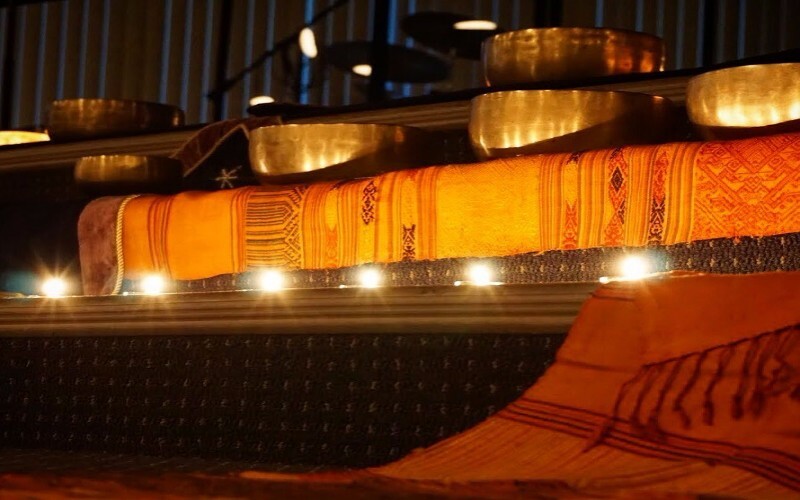 The final ancient metal Tibetan Singing Bowl has been meticulously arranged in its proper place. The facilitator looks up, smiles, and welcomes the crowd. We're ready to begin. Start by viewing the events in the calendar below. All events are newcomer friendly. TYPICALLY Every 1st week of the month. 7 - 8:30PM. No registration required.